1. Kristin Fahy-Part II? 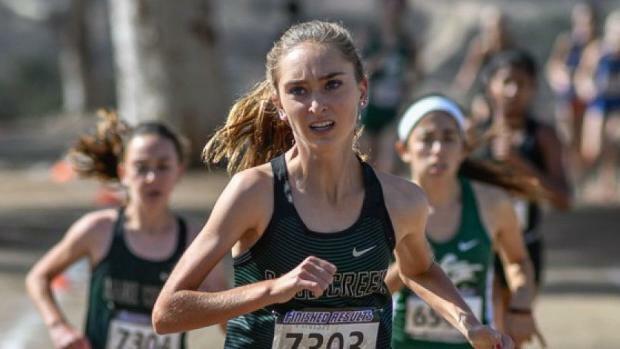 All eyes will be on Stanford-bound Kristin Fahy just as they were a year ago when she led until the final quarter-mile when she collapsed and could not finish the race. The LCC senior insists that's ancient history and since she's unbeaten in every major race-Mt. SAC, Stanford and the section meet-she has a lot to prove. She'll be the favorite and seems to revel in that position, just like brothers, Darren and Steven, before her. 2. What about the Mavericks' girls team? Was the 1-2-3-4 finish in the section meet because the Mavericks are that good or because the division wasn't that strong? A little of each, it seems. Fahy should be at a minimum a top 3, Jessica Riedman a Top 10 and Kyra Compton and Sydney Weaber are Top 20 contenders. Veteran Natalie Schroeder improved 10 seconds last week in the section meet and if she can stay anywhere near the No, 4, anything is possible. 3. Any other team? You bet. Sage Creek was second a year ago and beat D-IV champion Foothill Tech at Mt. SAC. Foothill, though, is a notoriously strong team at state, so the Bobcats will have to show improvement. The Wallace sisters, Skyler (9th a year ago) and Stormy (a freshman) are Top 10 candidates. Lavanya Pandey was 28th here a year ago and is running well. Junior Natalie Huestis and freshman Kiaya Rowlett, or two others on the deep Sage Creek team, will need to have big days. 4. Can Carlie Dorostkar crack the Top 10? Absolutely, based on how well she's running. Carlie Dorostkar, who was third at Mt. SAC, won the section title by almost a minute over Rancho Bernardo's frosh sensation Jacey Farmer. Although Dorostkar was 25th a year ago, she is running up to a minute faster and she is one who could thrive on the flatter course. If she were to run a minute faster Saturday, she'd be in the top five. 5. Who will be the surprise? If she can overcome hamstring tightness that plagued her last week, Christian's Alaina Zamorano is a Top 3 candidate after placing sixth here a year ago. Despite the pain, she won the section meet by 33 seconds. An even bigger winner was Mission Vista's Bella Longo who captured the D-III title by 52 seconds. She's a much better this year after finishing a distant 64th a year ago. And maybe Farmer will be unfazed as only freshmen can be.